Welcome to the Legacy Video Lounge Podcast! In this first episode, you’ll meet host Steve Pender. Steve is a professional personal historian, video biographer, and president of Family Legacy Video, Inc. (https://www.familylegacyvideo.com) in Tucson, Arizona. 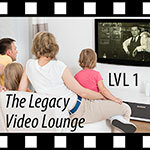 The Legacy Video Lounge Podcast is dedicated to the proposition that everyone, and that means YOU, has a life story worth preserving, celebrating, and sharing – and that video is a great way to leave a living legacy of life stories. The rising awareness of the importance of preserving personal history and life stories. What is a video biography or legacy video? The benefits of video biographies? Tips for hiring and working with legacy video professionals. Hints for video biography do-it-yourselfers. In this episode, Steve tells how he discovered his passion for personal history on video and became a professional video biographer. He also shares a clip from his very first legacy video. If you’re a “story junkie,” there’s probably nothing you like better than hearing a great story, related by an enthusiastic storyteller. Getting access to captivating stories and storytellers is growing easier, due to the proliferation of live, storytelling events. In cities across the U.S. and around the world, regular folks are stepping onto stages, shedding inhibitions, and sharing personal stories on a wide variety of topics. One place live storytelling has been flourishing is in Tucson, Arizona, thanks to the efforts of Penelope Starr. Penelope founded Odyssey Storytelling over twelve years ago. She’s also the author of a soon-to-be-released book packed with valuable advice for folks who’d like to start storytelling series in their own towns. In this episode of The Legacy Video Lounge, personal historian and video biographer Steve Pender chats with Penelope about Odyssey Storytelling, the power of sharing personal stories, and her upcoming book. Family keepsakes, as well as objects and places associated with important times of our lives and those of our ancestors, can play valuable roles in stimulating life stories for video biographies. In addition to stimulating recollections, these items and places can be included in legacy videos as visual elements. Personal historian and video biographer Steve Pender shares some personal experiences and observations about “Stimulating Memories with Keepsakes & Places.” in this episode of The Legacy Video Lounge. In Episode 14 of the Legacy Video Lounge Podcast, personal historian, video biographer, and Family Legacy Video, Inc. president Steve Pender answers a listener’s question about keeping up the energy during a life story interview. Inquire about storyteller’s energy level during preproduction. Do they have the energy for a full day’s shoot? If material is extensive, you may want to look at two days or more. If you’re determined to keep the finished video around an hour or so, plan on no more than around two hours of raw interview. Stay engaged with the storyteller – maintain eye contact, use nonverbal cues by varying your expressions, nodding, gesturing. Keep an eye on the storyteller’s energy level and mental focus. If he or she tires or starts to stray from the topic at hand, take a break. Do all the things you need to do to make your interview set a comfortable and fun space: Provide water, let the storytellers take breaks when they want, and let them know that do-overs are okay. Storytellers who are having a good time are likely to maintain better energy levels – so have fun! 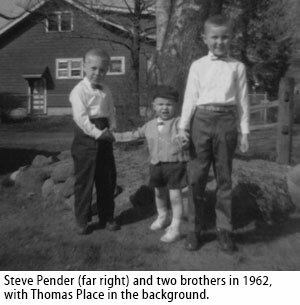 Professional personal historian and video biographer Steve Pender talks about the rising level of public awareness of the importance of preserving, celebrating, and sharing life stories. Steve describes personal experiences with people who have witnessed his presentations and touches on the TV shows “Who do you think you are?” “Finding Your Roots,” and “Our American Family.” Steve also talks about StoryCorps and Ancestry.com. He also shares the results of the American Legacy Survey, sponsored by the Allianz Life Insurance Company. In Episode 3 of The Legacy Video Lounge, video biographer and Family Legacy Video president Steve Pender answers the question: What’s a video biography – otherwise known as a legacy video? According to Steve, a video biography or legacy video is a personal documentary, which can feature a variety of production styles, ranging from simple “talking head” presentations to full-blown documentaries featuring interviews and as many visuals and audio elements (like music and sound effects) as budgets allow. What kinds of visuals can be used? Anything that can be shot on video or scanned and that helps to illustrate the subjects storytellers will talk about during their interviews – including still photos, newspaper/magazine clippings, diplomas, wedding announcements, plaques, trophies, medals, paintings, drawings, letters, keepsakes, souvenirs, childhood toys, and family videos (or films converted to video files). Video biographies can include all the elements of the storyteller’s art – images, spoken word, music, sound, text on screen, graphics, like maps, etc. It’s not enough to just capture stories, we want our families to want to come back and watch again and again. So we need a little entertainment value – which is fine as long as everything that’s included is in service of the story. Steve has been creating videos that tell stories – first for corporate clients and now for individuals and families for over 38 years. So he knows how to apply the creativity and techniques that big budget productions use. There are certainly advantages to working with a professional video biographer, because there’s a good deal involved in properly planning and producing a legacy video. But if you’re a do-it-yourselfer, especially if you’re just getting started: Tune in to the History Channel, or get your hands on some of Ken Burns documentaries. Watch them critically. See how interviews are staged, how music and sound effects are used, how photos and other visual materials are incorporated. Then, experiment with these techniques on your own. With some time and practice, you can use these same techniques to give your home-made video biographies a bigger budget look and feel. Contrast and compare a basic “talking head” treatment with a documentary-style video biography here. If you have any questions or comments, please email them to Steve Pender at steve@familylegacyvideo.com. And remember: Everyone has a story. Isn’t it time you told yours? In Episode 4 of The Legacy Video Lounge, host Steve Pender, personal historian, video biographer, Family Legacy Video president, welcomes his first guest to the lounge: Kristin Delaplane, author of Storytelling: How to Write an Inspiring Memoir, Oral History, or Family Genealogy, and First to Die: The Tragic Loss of the SS Vestris. While The Legacy Video Lounge is dedicated primarily to video biography, Kristin is a personal historian who works mostly on the print side of personal history. Ms. Delaplane comes from a writing family; her dad, Stanton Delaplane, was a Pulitzer Prize recipient and a columnist for the San Francisco Chronicle. Kristin wrote for the Chronical as well for many years, and now she helps people capture their family or company stories through oral history interviews and historical and genealogy research, with the end result often being a carefully crafted narrative for a custom-bound book. Her clients have included notable American families and celebrities, including Best Actor Oscar winners and a Kennedy Center Honoree. Kristin’s business is Our American Stories LLC. In Part 1 of a two-part interview, Kristin talks about her career, what drew her to personal history, the process she follows when creating a print memoir, the benefits of creating a memoir, as well as her new book. In Episode 5 of The Legacy Video Lounge, host Steve Pender, of Family Legacy Video, Inc., continues his chat with Kristin Delaplane, a personal historian who specializes in print memoirs. Kristin is the author of Storytelling: How to Write an Inspiring Memoir, Oral History, or Family Genealogy. During her conversation with Steve, Kristin describes the book’s contents and passes along some tips to budding memoir authors. She also reads an excerpt from another of her books, First to Die: The Tragic Loss of the SS Vestris. How can legacy videos benefit your family storytellers and your families? In Episode 6 of The Legacy Video Lounge, host Steve Pender, of Family Legacy Video, Inc., explores this topic with David Lamb. David is a successful businessman who hired Family Legacy Video to produce two family video biographies. David explains what led him and his wife, artist Robbi Firestone, to pursue legacy video projects for David’s mother and Robbi’s father. He also touches on his expectations for the projects, and the ways the legacy video process – and the final results, were of value to both the storytellers and their families. 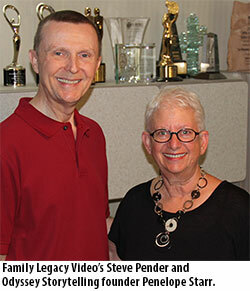 In Episode 8 of The Legacy Video Lounge, personal historian and video biographer Steve Pender of Family Legacy Video, Inc. in Tucson, Arizona, talks about capturing the voices of your loved ones for posterity, in the form of audio-only oral legacies known as audio biographies. If you’re not crazy about appearing on-camera in a video biography, if you’d prefer a less-costly alternative to video, or if you prefer the spoken word, an audio biography could be right for you and your family. Steve shares his approach to creating an audio biography, as well as an audio biography excerpt. You’ll also learn about the audio gear Steve uses. In addition, Steve shares some sources for audio transfers – King Tet Productions, free audio editing software – Audacity, new and used equipment – B&H Photo/Video, and equipment rentals – BorrowLenses.com. In Episode 9 of The Legacy Video Lounge, personal historian and video biographer Steve Pender of Family Legacy Video, Inc. in Tucson, Arizona takes the podcast on the road! During a recent drive from Tucson to a legacy video shoot in Santa Monica, California, Steve recorded a chat with his cameraman and lighting director Dan Crapsi and sound technician Chris Hall. Both Dan and Chris have decades of video and audio experience, working on commercial, news, corporate and legacy video projects. During their conversation, Steve, Dan, and Chris touch on a variety of aspects surrounding recording personal history interviews, from the technical to the creative, including shot composition, lighting, microphone selection and placement, and more.